Not native speakers? No barchelor degree? How to get visa in China? How can I provide talents for jobs offered? Chinaexpat.cn now is providing unique culture & language exchange programs for young people from all over the globe! Our homestay programs are different from others. You do not have to do any kind of work for your host family like cooking, cleaning or washing dishes. Our live with a Chinese family to learn Chinese program means that our students stay at home with a Chinese family. Participants of the program live with the host family, go travelling with them, and join in all kinds of daily life activities. Of course, Homestay students will have their own room, three meals per day and enough free time to enjoy and explore China on their own. 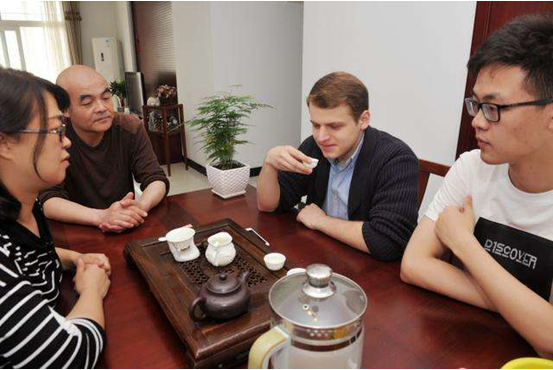 If Homestay students face any problems or unexpected difficulties, Homestay China is always keen on solving problems and giving their support to Homestay students and host families. Our program China's families are chosen by a very intensive selection process. Most of the families are very wealthy and educated. They are open to Western culture and will do anything they can to make sure that our program students' stay in China becomes an unique and wonderful memory. My name is Benny Liao, I am from United States from Provo, Utah. Choosing to come to China was one of the best things I have ever done with my life. HomeStay China selected me to go to Guiyang, China, a place in China where many Chinese don’t even know about. I did not know what to expect when I got there, however it was the perfect place for me. The family that I stayed in were the most hospitable and caring family that I could have. They treated me just like I was part of their family and was warmly welcomed. I had to teach their daughter(11 years old) and their son(13 years old), and also play with their youngest son(4 years old). Teaching English with these children could be difficult at first because I did not have very much experience, but once you learn to know the children better you will get the idea of how to teach them. The children are very hard working and are dedicated to learning English. I have noticed that they have a very strict way of learning, so they learn very quick. Overall, I love the family that I lived with and they are been a great part of why Guiyang was so great. Life in Guiyang is truly a lifetime experience, there is so much to do in the city. So many great places to see, and people to meet. Going to amazing villages out of the city, and visiting the malls and temples all around the area is so fun. The best part of my life in Guiyang is because of the other foreigners that you meet here. They become part of your life and learn to help each other. I have made friends here that I will treasure for the rest of my life. My time here in China has been better than I ever could have expected. I traveled around, experienced chinese culture, learned chinese,and was able to see China in a way that touring china could never offer. living in a Chinese family was a great way to see how China's day to day altually works. simply coming to china doesn't allow you to see what homestaychina's immersion offers. I have made lifetime friends here.China is a very special place with so much history. I'm grateful to my host family and homestay china for allowing me to have this incredible opprtunity. My experience in China was very useful. When u live with a Chinese family u can learn many things, about Chinese life habit. custom, I learned a lot from it. I understoon h ow Chinese people live our life and their thinking, I understand all the differences in my life, I can face with Chinese life and undertand all the differences beween my life(Italian habit). And their life, also I could improve my Chinese, so I am happy to do this experience. This is a fantastic possibility - beyond belief. I will never forget! To be able to experience China in the best possible way. You can't do it on your own. The small problems that came up when I tried my best to adjust to the different culture where easily solved with the help of the nice and efficient employees from Home Stay China. I felt confident.